Summer is around the corner which means jobs, internships, seeing old friends, and moving residence. This was how my past two summers of my college career looked, and for those doing the same enjoy the time that you get to spend doing these things as they are meaningful and important to your personal growth. I have 2 years left in school, and I felt like I had to do something different this summer to gain new experiences and knowledge. Next Thursday I will be heading to Spain to take a marketing class, and then traversing my way throughout Eastern and Northern Europe to expand my horizons and understanding of the world. Going to popular tourist attractions seems nice, and I will visit a few, but I want and plan to do something that will immerse me in the local culture of each place I visit. This is my first time ever stepping foot outside of the country, and I may be adventuring it solo for a few stretches of the trip to visit the sights and cultures that I want to see. I feel like when I came to SDSU, I learned alot about myself within just a few weeks, as it was the first time I had lived on my own. Now that I have the opportunity to explore new and exciting places in a similar fashion, I will be making the most of my time. Obviously this sort of thing is outside of my comfort zone, but if I have learned anything about starting an adventure it is that I have to escape that comfort zone to learn more about myself. I highly recommend to anyone reading to study abroad while you’re still a student to push yourself outside of your comfort zone, even if you have to go by yourself. 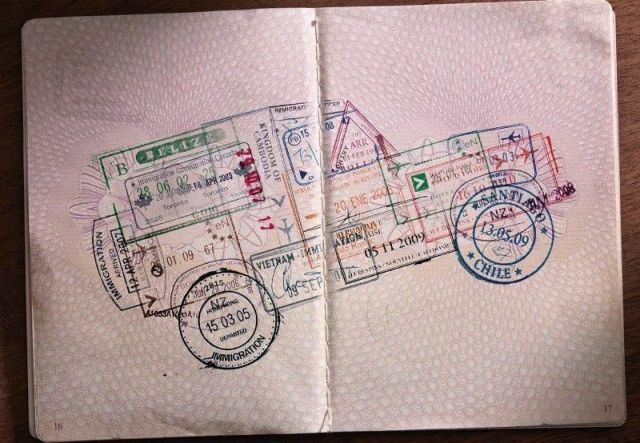 This picture is a Land Rover advertisement in Germany from 2008 that uses passport stamps from various countries to outline the shape of the car. I found the picture in a thread titled “A picture is worth 1000 words” from a gaming site I frequent, teamliquid.net, and this image spoke to me because it puts importance on getting out in the world. Spending money on experiences rather than material goods is a habit I have been trying to adopt, and this is my first test of that mentality. The image was intended to do what I described above, to inspire people to travel and see the world they live in. The marketing executives at Land Rover created the campaign to target their demographic of people who like to explore, as the Land Rover is sturdy all terrain vehicle. I chose this picture as my discussion topic because I always try and set short term and long term goals and plans as a way to structure my life. This is one of my plans I will be spending alot of time doing this summer, and will be the basis for all future traveling that I plan on doing.